What Lexie Loves: Access All Awkward - book review! Access All Awkward - book review! Hi everyone!! So today I've got a new post as part of a blog tour with Scholastic. 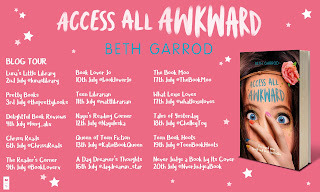 This blog tour is around Access All Awkward, a new book in the Awkward series by Beth Garrod. This book is primarily targeted at tweens, however for all my older readers out there, it's a lovely, refreshing break from YA and teen fiction. I was lucky enough to be asked to do a blog post today on it, and I'm really excited to share my opinions on this book with you. 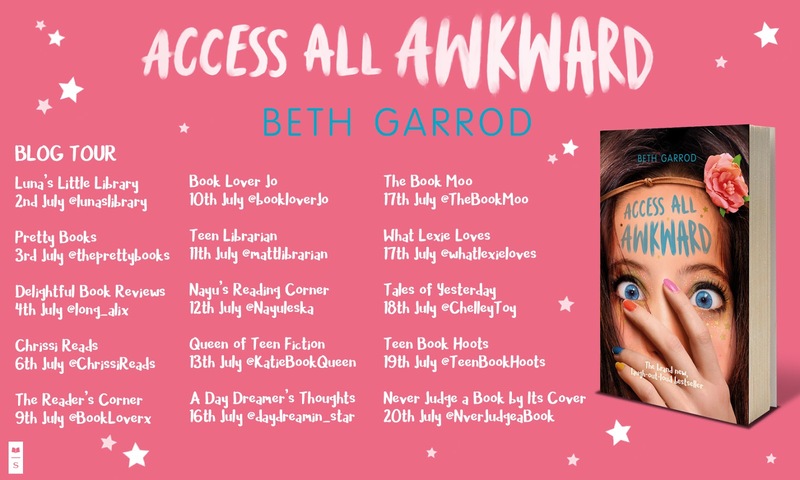 Access All Awkward is all about Bella Fisher who is stuck right in the middle of ... exam season. Who doesn't love that?! *sighs* The only thing that is getting her through the week is the promise of a fun cool festival with all her friends. There is only one slight problem - she can't afford a ticket. This leads to her working lots of jobs like litter picking and toilet scrubbing but she knows the concert will be so fun. When she finally earns enough money for a ticket, the concert doesn't turnout like Bella though it would. Firstly, her mum has sent Bella's older sister Jo to spy on her and her bestie Rachel is hanging out with some mean girls. What's worse is her ex is there with his hot new model girlfriend. Awkward! One of the things I love about this book, is many aspects are very relatable. Beth just nails life as a teenager, getting all the reactions, thoughts, references and language correct! I think it's really great to see an author accurately portray what life is like as a teenager these days, as many get it pretty darn wrong, which is really really frustrating and aggravating to read! And as a teen myself, I love how real and relatable I found the book. (Although it includes stereotypical teen language like bromance, wifey and AF, so if you don't like that kinda language - maybe this isn't for you!) Personally however, I just find it really nice, particularly as it makes Bella more realistic in my mind too. Another thing I enjoyed about this book was how funny it was!! There are quite a few times where I actually full-on laughed out loud during the reading of this book. It's a really chill, amusing read, which is great when I want a break from reality but don't want to read anything too heavy. I think it will be a very popular read this summer!! I also absolutely love the characters in this, they all feel so genuine and real. My favourite, of course, has to be Bella Fisher.. she's so funny and awkward.. and I do see quite a bit of myself in her haha! And she also has her amazing two best friends, Rach and Tegan, I love seeing wholesome, lovely friendships in books. I would definitely recommend this book to all tween girls, or teenagers who like having an easier read every once in a while. Thanks so much Scholastic for inviting me to be part of this blog post tour. I'll be back soon with my next post - fun things to do as a teenager this summer. I enjoy reading contemporary, which is weird because I'm more of a fantasy kind of girl, but I LOVE reading novels with hilarious characters. That's always a big plus!